The Harley Davidson Ironhead Sportster X Series has been described as one of those rare symbols of American history. The first production models hit the roadways in 1957-1985. Back then no one would have ever thought the Sportster would still be in production over 50 years later. This respectfully earned it a page in the motorcycle history books. As the longest production series in the nation the Ironhead Sportster earned a reputation that would continue to follow it well into the 21st century. The muscle behind, (or underneath) the 1957 Sportster was the 55cid 900cc Ironhead. The 7.5:1 Compression rate, 90 degree valve angle, and four cams offered a never before seen thrill ride to the motorcycle enthusiast of its time. This beast (the Ironhead Sportster) continued to tear up the highway until 1972 when Harley Davidson decided it was time to increase the power of this road demon. This bike is called The Skullster﻿. Just when they thought it could not get any better. Harley Davidson introduces a bigger, faster, and more efficient 1000cc power house for the Sportster. With its 61cid, 9:1 CR, and 43mpg the new and improved Ironhead blasted its way down the road in excess of 110mph, but Harley did not stop there! Over the next 13 years (1972-1985) Harley continued to improve the performance of an already perfect ironhead sportster power plant. Sadly the Ironhead met its successor in 1985, with the introduction of Harley's newly innovated Aluminum head Evolution engine (883cc/1100cc). Although Harley put an end to the Ironhead's career they certainly did not stop its legacy. The Ironhead Sportster is still in production today. With over 50 years of innovation it is still arguably the best production line of motorcycle in the world. Many motorcycle enthusiasts today argue that it was not the Ironhead's power that made it so famous. Whether it was or not makes for a good debate. However one thing is for certain. The Ironhead's power was definitely not the only contributing factor. At the end of the 2nd World War solders coming back to the States kicked off the Bobber age in the motorcycle industry. Discarding any unnecessary parts, and making the bikes lighter subsequently supported the theory that the motorcycle would reach higher speeds. Whether factual or not one thing's for certain, it was a trend that would change the motorcycle world forever! Bobber's continued to be popular among riders through the 60s. With all the home motorcycle modifications taking place a new bike customization was inspired. Bikers found that with a longer front end the bike rode smoother at higher speeds. This Modification kicked off what is commonly known today as the Chopper. 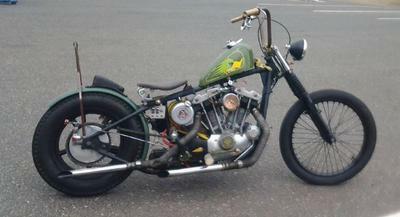 Choppers have a distinct neck rake angle, and longer front ends that separate it from the appearance of a factory bike. 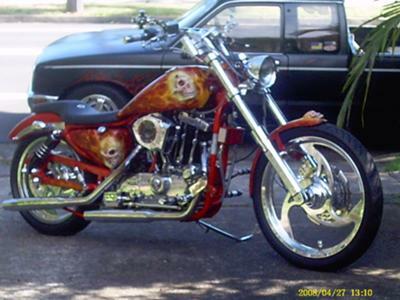 Choppers are also known for having all unnecessary parts removed. Many Chopper owners run bikes that are not street legal, (No mirror, turn signals, or plates) thus keeping the Bobber tradition alive. 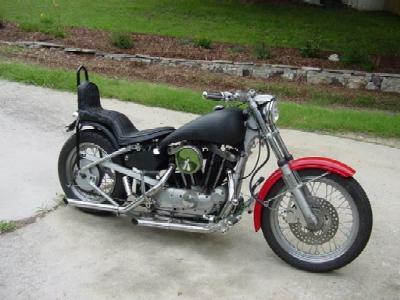 With the Chopper craze in full swing and the growing popularity of the Ironhead Sportster in the early 60s it was only right to see the first Harley Davidson Chopper. Custom Harley's have continued to make their mark on this industry with speed and success. One thing that can be fairly stated is the Harley Davidson Ironhead has made its mark on history, and is here to stay as a classic American Legend.